MyFXChoice is a forex broker. 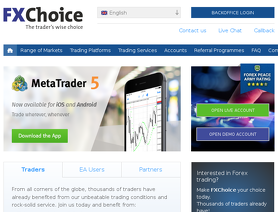 My FX Choice offers the MT4, MT5 and MT Mobile trading currency platforms. MyFXChoice.com offers currency pairs, metals and cfds for your personal investment and trading options. FXChoice is a global broker specialising in CFDs and Forex for private and institutional clients, not to mention fund managers. The company offers the tried-and-tested platforms of MT4 and MT5, with trading on the go also available via mobile apps. FXChoice prides itself on its customer service, aiming to be the industry's best. I live in Chicago and I just want to let any and all traders who are from the US that these guys can be trusted. Been with them bout 5 yrs and I cant complain bout anything, I for the first time did a BTC deposit today from a Bitcoin Depot machine and it cost me $ 5.00 yes 5bucks. I simply got my wallet number ready from the fxchoice website, typed my info into the machine, inserted my cash and flashed the barcode the fxchoice website gives you and i put it in front of the machine and Bam its done it took roughly 15 minutes . was alittle nervous cuz it was $ 500.00 I was transfering, if you wanna go offshore guys this is your broker. If we can only deposit small amounts what happens if we try to withdraw large amounts. FXChoice is very good. I am associated with several people who are using them and everybody is happy so far. But it was very hard to deposit funds with them even in tiny quanitites. So that makes us wonder how hard it will be to withdraw large amounts from them. I joined MyFxChoice and opened a live account. I have started and started trading the account. For now there is no problem but I will be updating the community my sincere experience with this company. But I will like them to keep the good work so that one day, they will become number one in the world. great broker i been a supporter of fxchoice for many years i wish they would lower their Margin call/ Margin stop: 100/80 on their pro account to maybe Margin call/ Margin stop: 70/50 or lower. Jan 15, 2019 - 5 Stars so i decided to stay with FXCHOICE, there are brokers with better spreads but i can't trust them, fxchoice always pay withdrawals and do so very fast . a broker that pays withdrawal small and large outweigh better spread brokers any day. Dec 14, 2018 - 4 Stars fxchoice is a great broker but i must move on, i trade the classic account because of the lower margin call / stop out levels, i must move on because the cost of doing business is just to expensive with the higher spreads and the swap rates are killing my profits. Jul 4, 2018 - 5 Stars Best Damn Broker For U.S. Traders. customer service is the best, deposit and withdrawal top notch and very trustworthy. for U.S. traders this is the broker you want and need. Mar 25, 2018 - 3 Stars Epayment no longer except US Citizens. and you can't convert your bitcoin to fiat currency so where back to depositing by wire transfer with fxchoice. i hope they find better payment options, not everyone has 2K to wire just to get the fee back. Thank you for your message. Bitcoin is included as an option for depositing and withdrawing. Please visit our “Deposits and Withdrawals” page to see all of our payment methods. You can find this page under the “Accounts” tab from the main menu. You can click on each one of the payment options to read details such as process, instructions and other information. Should you have any further questions or need assistance, please do not hesitate to contact us. Thank you again for another valuable review. As we have explained in similar comments by other users, Bitcoin deposits to a fiat-denominated account (such as USD and EUR) are currently suspended until further notice. Please note that for our US clients we reimburse any wire transfer fees for deposits of $1000 and over. We are sorry that a third-party company has affected your experience trading with us. Please note that our clients can deposit and withdraw Bitcoin and Bitcoin Cash to/from the corresponding accounts. If you want to make a smaller deposit, we would recommend that you open a Bitcoin-denominated (or Bitcoin Cash-denominated) account and fund it with Bitcoin (Bitcoin Cash). As per your concern about the wire transfer amount, US clients can deposit only $1,000 to qualify for bank fee reimbursal. We are working on adding new payment methods for our US customers and will keep clients informed of any progress. Meanwhile, should you have any questions, our support team will be glad to assist you. Please accept our sincere apologies for the delay in response regarding the technical issues with the website’s (FPA) reviewing system. Thank you for your review and close attention to our services. We would do our best to help you solve your connection issue if you could share more details of your particular case with our support team. Nonetheless, we can assure you that our server connection is stable and the issue should be not from our end. As per your concern about Myfxbook updates, we cannot be held responsible for third-party service quality. We recommend you address your request directly to the system in question. Our support team is always there to assist you. Thank you once again for sharing your feedback here. We are sad to hear that you are having to move on due to spreads and swap rates. We believe that we offer some of the most competitive trading conditions as an STP broker. We would like to point out that our Pro account spreads are very competitive and that you can even gain by reducing commission using our loyalty programme ‘Pips Plus’. For more information about our loyalty programme, please visit our Pips Plus page which you will find under the Trading Services section from the menu. Additionally, if you contact our customer service, we will be more than happy to look into your account and discuss your trading strategy, so that we can recommend the best trading account to suit your requirements. We are delighted to hear that you have decided to stick with us. We appreciate your loyalty and thank you very much for trusting us. We do our very best to ensure the smoothest and fastest possible transactions in order to enhance our client’s trading experience. FXChoice is a great broker! They also have a great support staff that will answer your questions around the clock, when you need them answered. I have had a MAM with them, that has been very easy and straightforward to setup. I have also had regular accounts with them & they never disappoint. Deposit(s) and Withdrawal(s) have also been pretty smooth as well with no issues. Now you can deposit & withdraw via Crypto-currencies which is pretty cool too. It’s a pleasure to read your encouraging review; thank you for taking the time to share your feedback. Our friendly and experienced Customer Support Team is on standby 24/5 to answer your questions and assist you with your regular trading accounts, as well as any other need as an FXChoice Partner. We have indeed enabled Cryptocurrency deposits and withdrawals to enhance our clients' funding experience which is very crucial. You can also find out about other methods by visiting the Deposit and Withdrawal page on our website, or by logging in to your Backoffice Profile. I just want to say that FXChoice have been my favorite broker by far of all the ones I've traded with, and I've traded with dozens. Their spreads are reasonable, not the best, but fair. Their swap fees are fair. Their execution is very good. Their slippage is fair (works both ways). Their office communication is good, and they just generally seem to be HONEST instead of trying to destroy you at every turn unlike MANY OTHERS. This is why I'm saddened by their decision to suspend all bank wire transfers because of regulator pressure. It seems like regulation's main purpose isn't to protect the small guys but to keep profits in the hands of the big companies. It doesn't matter if a broker is regulated in the UK or Belize, what matters is HONESTY. Other brokers I can't name in this review are highly regulated in UK, Australia and USA and yet they act criminally. Sadly, services like Skrill, UPay, Netpay, are simply no good for me as they charge criminally high fees. 6% is a decent yearly return and you expect me to pay that every time I deposit and withdraw? It's a deal breaker. So goodbye FXCHoice, I will miss you terribly. I just hope I can find a broker that is half as good as you that offers bank transfer deposits and withdrawals. We thank you for your thorough review and excellent rating. We are sad to read that you are having to leave us because of the enforcement of wire discontinuation. We are working on improving our clients funding experience by adding various other methods. We have recently introduced VLoad and is currently offered with 0% in and 3.5% out = 3.5% in total. As for UPayCard, the fees are 2.9 in, 0.9% out = 3.8% in total. Additionally, if you own an ePayments account you’re in luck as the fees are only 1% in, 0% out = 1% in total. There is also of course the option to deposit via Bitcoin with a 15% Bonus and no Fees. For more information and details about all of the above methods and offers we recommend that you visit our website. Thank you once again for your kind words and we wish you all the best in your future trading. Jan 7, 2018 - 1 Star I have found fxchoice to be very unreliable, their site constantly goes down during trading hours right in the middle of a trade you get locked out. Also, they recently screwed me over $2 for a trade I never placed that just appeared on the screen as I sat watching the market. I was so shocked I didn't have time to even react before it shot up and stopped me out and then immediately shot down the other way. They refused to reimburse the amount of $2 and change. So they screw their clients over such an amount; their spreads are awful so I am done. BE VERY AWARE choose another broker and don't risk their shennanigens. Thank you for your feedback and airing your concerns on a public forum – it gives us the appropriate platform to defend ourselves from your scathing and completely unfounded allegations. Firstly, let’s tackle this mysterious $2 phantom trade that ‘we’ just put on your account. We have already discussed this with you in Live Chat. That trade was opened from your IP address, meaning that you opened that trade. We have unequivocal proof that this is so. Secondly, you claim that our website ‘is constantly down’. It is practically never down, and nobody has ever complained about it before. This, again, sounds like a problem at your end, not ours. Thirdly, you claim that because we would not refund the $2 to you, that means we are a money grabbing organisation that ‘screws’ its clients. Katrina, we have the best customer service in the Forex industry and are famous for it. We care deeply about our clients’ success. If we refunded you $2, that would be an admittance of guilt. But we have already proven that we are not guilty, and it was, in fact, you who opened that trade. To respond to your complaint, we have had to mobilise a number of members of staff whose service costs the company a lot more than $2. On principle, we do not give money to people for simply complaining when they are so clearly in the wrong. It would set an unsustainable precedent. We believe that your recent experience was very unfortunate. Although we had, at that time, released the news about discontinuing wire transfers, as our Customer Support Representative informed you, your transaction would have gone through if you had used the correct SWIFT code. Our shift supervisor called you that same day and explained that you could proceed with the transfer, as long as it was processed within the next few days as the discontinuation of wire transfers was put into force. Our system shows that you successfully initiated the bank wire and received the money into your trading account. We are sorry for the inconvenience caused and wish you all the best. Could you guys please add other withdrawal options for U.S. clients. UPaycard is an absolute hastle. Not a good option. Feb 18, 2018 - No Rating I have an account with you guys and recently tried wiring funds into my account and unfortunately my bank denied the transfer, You guys should definitely include a form of VISA depositing method. We are sorry for the inconvenience that you experienced with your wire payment. Please note that we receive dozens of payments from the US on a daily basis, so there shouldn't be any problem. If your bank cannot send a payment, please consider using another one. Our banking credentials should work from any bank in the US, save 1 or 2. As for the VISA depositing method, we are working on adding new payment methods for our US customers and will keep clients informed of any progress. If you have any questions, please get in touch with our support team who stand ready to assist you. Also please accept our sincere apologies for the delay in response - technical issues with FPA's reviewing system meant that we were unaware of your review until very recently. Thank you for your feedback. Please contact us and provide more information about the problem you had while trying to use UPayCard so that we can better understand and resolve the issue, or suggest a different option for you. We are working on adding more payment options, and we will notify all clients about our progress as soon as possible. We hope for your understanding, and we are sorry for the inconvenience caused to you. Dec 27, 2016 - 1 Star This is a scammer company. Plz avoid deposit in to this company . I did big mistik to open account and deposit. The account are not reall. Plz plz avoid!!!!!!!! We are glad that you commented here on FPA so that we can address this matter in front of everyone. You call us scammers and make many other claims, without providing any evidence. Well, like we said we were glad that you commented on FPA. We will not complain here how you abused our support staff during your chat sessions. Instead, we will present the facts. Here is the email that we sent to you once before, it explains in detail what happened. Thank you for your email. We are not really sure how to interpret "Its last warning .other im going to report and try to ban ur scammer company," we have to say that we read it as being quite brusque and lacking in professionalism. We do understand your frustration after losing your trades, in fact, few inexperienced traders found themselves in similar situations like yours after losses. Already, through our several live chats sessions and emails, we clearly replied to your complaint about your closed trades at stop out levels and bonus write off. Again for your understanding, let us explain to you one more time. 1. 19th Dec - 25 USD on 100 USD deposit. 2. 20th Dec - 127.50 USD on 500 USD deposit. 3. 21st Dec - 25 USD on 100 USD deposit. Out of these three bonuses, you completed trading volume requirement only for the 1st bonus i.e. for 25 USD and the bonus has been converted and then added to your balance on 20th Dec.
After that you lost most of the funds in your account as a result of a series of stopped out trades before reaching the trading volume conditions for 2nd & 3rd bonus, so your statement "I allready rech the limit of boness" is completely wrong, you reached trading volume condition only for the 1st bonus and it was converted and added to your account balance. And as per our bonus terms and conditions "5. Bonus is written off the account once the equity of your account minus Bonus is less than or equal to margin call level***." so, we removed your 2nd & 3rd bonus i.e. 127.50 & 25 $ from your trading account right after you were stopped out of your short trade 8243931 for 0.50 USDCAD at 2016.12.22 15:30:38, just before the Canadian CPI and the US unemployment claims came out and moved the market against you. In short, you lost your funds because of your trading strategy & improper fund management, which resulted in the removal of the bonuses as per terms and conditions that you accepted. Therefore we ask you to clarify where and how we scammed you. We have tried to explain via our ticket system on many occasions about your recent concerns, but it seems that you do not want to understand. First of all, the bonus that you are referring to as your money which you can’t get back, we have clearly explained that according to the terms and conditions the bonus is automatically written off once the equity of your account minus Bonus is less than or equal to the margin call level. As for your comment regarding commissions and swap fees, Islamic accounts are swap free under Islamic conditions. However, commissions are still charged. An Islamic account has trading conditions almost identical to those on our standard accounts; however, there is one notable difference: no swap charges are applied. Please note that for trades where the swaps are normally positive (for instance, Buy on AUDUSD) the commission would be zero, and for those trades where Swaps are negative (Buy on EURUSD or Sell on AUDUSD etc. ), the commission will be 75% of the swap, i.e., 0.75*swap. Other than that, conditions for our normal accounts and Islamic accounts are identical. We tried to explain this as well but again you have ignored our communication. Information about bonuses and Islamic account conditions can be both found under our FAQ and Knowledgebase sections on our website. FX Choice is a very good broker. Many thanks for your great rating. We wish you all the best in your trading.